2. Roasted coconut pieces - 2 tsp. 6. Cardamom powder - 1/2 tsp. 10. 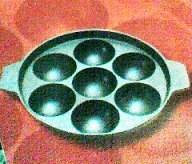 Special mould (Appakara) to get the proper round shape. Cut the banana and mash it nicely. Mix rice flour with the roasted coconut pieces, and the mashed banana. Melt jaggery (molasis) in water and boil till it becomes thick. Add this to the above mixture to make a smooth batter,and add soda bicarbonate, seasame seed, and cardamom powder. Heat the mould (appakara) and fill the cups with 3/4th oil. When the oil is heated pour the batter in the cups. Stir till all the sides turn golden brown. Remove the cooked unniappams from oil, drain and set aside.